Ever since I learned that it is once again legal in Alaska to shoot wolves from airplanes and to kill wolf pups in their dens, I have not been able to get the fate of the wolves out of my mind. I have always been fascinated by wolves and never bought into the widespread fear and paranoia about them as vicious and predatory animals. When Clarissa Pinkola Estes came out with her magnificent book Women Who Run With the Wolves, I was caught up in her yearning to be one with the wildness of these mysterious animals. Since then, I have had dreams of running with wolves. I've learned that these fleet-footed ones can cover 25 miles without breaking stride. I imagine them then sleeping under the open sky. In wilderness places where they are still living, the howls of wolves can be heard for miles. Last night I heard a noise late at night. Was it the spirit of a murdered wolf? I have read that wolves are like yogis; they have the ability to regulate their body temperatures in diverse conditions. I also marveled at the fact that they share food with the old who do not hunt. Native Americans believe that wolves have good medicine as teachers and parents. I often use the Medicine Cards to explore what wisdom animals represent in that tradition. I have never pulled the wolf card as my totem, but I have looked up its meaning: "Wolf is the pathfinder, the forerunner of new ideas who returns to the clan to teach and share medicine." I aspire to be like the wolf in this way. If you, like me, are stirred by wolf medicine, I ask you to join me in supporting their cause. 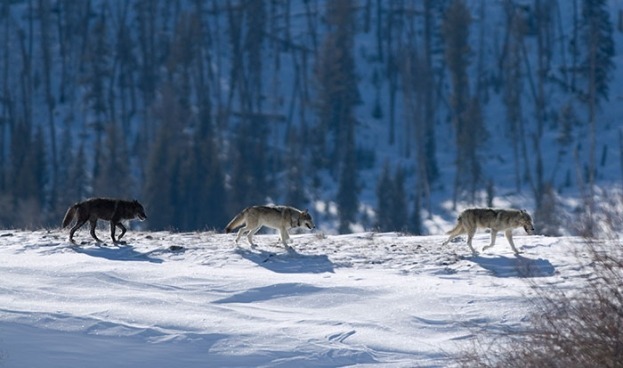 Some suggestions are included in this blog post from 2011: A Prayer for and With the Wolves.